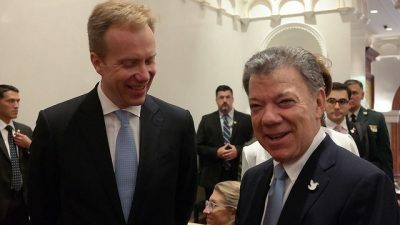 Norwegian Foreign Minister Børge Brende admitted to being “extremely disappointed” Monday morning after Colombian voters rejected a peace pact that Norway had helped hammer out between the Colombian government and FARC guerrillas. Norway played a key role in the peace deal and its rejection is a huge blow to Norwegian peace-brokering efforts, but Brende said ministry teams will now try to ressurect it. “There’s no doubt we are extremely disappointed,” a clearly saddened Brende told Norwegian Broadcasting (NRK) on an early morning newscast. He had been in Colombia just last week to attend ceremonies when the 300-page peace agreement was signed by government authorities and FARC leaders. The peace deal was supposed to end 52 years of war in Colombia that have killed so many and uprooted millions more. The agreement was subject, however, to a vote by the people, with a referendum held in Colombia on Sunday. Public opinion polls had indicated it would be approved, so its rejection was a bitter disappointment to those advocating its acceptance. NRK reported that some Colombians cried in anguish and fear that armed conflict will resume, while others were jubilant that democracy had prevailed. Brende pointed out that voter turnout was low for the referendum and that the peace agreement was ultimately rejected by just a slim majority of those who voted. The referendum results have been accepted, he noted, and he denied that all the work in crafting the rejected agreement was in vain. On the contrary, Brende noted how the peace pact was very detailed and can serve “as a basis for further talks.” He said a Norwegian team of negotiators has already been asked to return to Havana and try again to improve the agreement, to make it more acceptable to all Colombians. “Of course we’ll try to help,” Brende said. Opponents of the agreement had complained that FARC guerrillas would avoid prison or accountability for their crimes over the years. Others were unhapy that some FARC officials would get seats in Parliament without having to win election until 2018. Those bashing the peace pact want FARC to be held more accountable for their actions, including kidnapping and violence, instead of basically being granted a massive pardon. Negotiations led by Norway and Cuba and with assistance from other countries including Chile began in Oslo four years ago. Brende has said that both sides in the conflict had “shown strong willingness and bravery” in coming as far as they did in drafting the peace pact. Even though the pact was declared to be the best that was possible to produce, Brende said all involved will now go back to the negotiating table and work to improve it.